Matvei Platov was Ataman of the Don Cossacks. He distinguished himself in the campaign against the Crimean Tatars in 1774 and later, under Alexander Suvorov, in the Kuban Valley in 1782. He participated in the capture of Ismail in 1790 and was awarded the Order of St. George (3rd Class) and promoted to major general. However, Emperor Paul disgraced him and exiled him to Kostroma and then put into Petropavlovsk Prison. In 1801, Platov became Ataman of the Don Cossacks and transferred the Cossack capital to Novocherkask. Platov took part in the 1806 Campaign against the French and fought at Eylau and Friedland in 1807. In 1808 - 1809, he fought the Turks in the Danube Valley, distinguishing himself at Girsov, Rassevat, and Silistra. Platov then returned home and ran the local Cossack administration. In 1812, he commanded a Cossack Corps and supported General Bagration’s 2nd Western Army. He defeated the French at Mir and Romanovo and covered Bagration’s flanking movement at Moghilev. 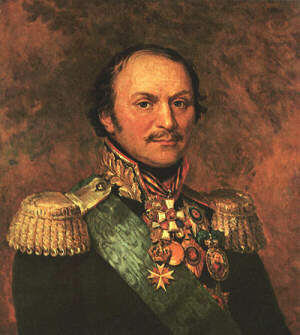 Platov led the famous flanking attack on the French positions at Borodino on 7 September 1812. During the 1812 Campaign, he mobilized over 20,000 Don Cossacks and harassed the retreating French troops. He successfully fought during the 1813-1814 Campaigns and later accompanied Emperor Alexander to London. The City of London presented him with a golden sword and the University of Oxford conferred to him a honorary doctoral degree. Platov spent next couple of years at Novocherkask, where he established a school and typography and ran the local administration.